I’m on a mission. Ever since, and probably before, I wrote about rock climbing as a transformative practice in August 2010 I’ve been trying to find information on what is really the difference between embodied transformative practices like yoga and martial arts versus rock climbing. When I search writings of spiritual leaders they just say “Nope, not the same, never will be” but don’t explain why. I finally found an article that tries to explain it to me in the language that I speak: Flow! Many of you know I’m a Flow freak (see my other posts). 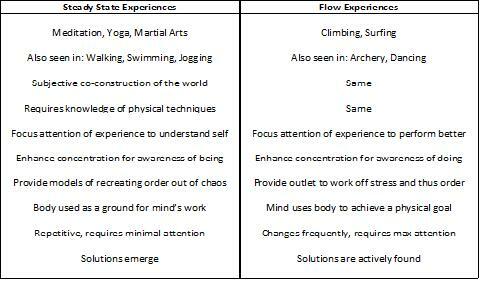 I love trying to experience Flow when I climb and I try to experience it in my everyday life as well. I finally found an academic article that the father of Flow, Mihaly Csikszentmihalyi, wrote in 2000 with Jeremy Hunter entitled, “The Phenomenology of Body-Mind: The contrasting cases of Flow in Sports and Contemplation” from the Anthropology of Consciousness Journal (see my list of articles below to read the full article). 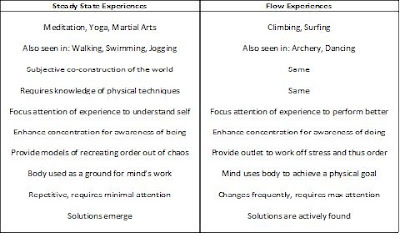 The article cited many differences between Flow in sports and contemplation. I listed a table for a quick reference. One of the key differences that finally made sense to me was that the physical demands of a more contemplative activity (examples they use: running, swimming, jogging, meditation, some easy yoga) are easier, require minimal attention for a sustained period of time and have a repetitive nature. 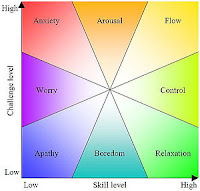 When this environment happens it produces what they call a “steady state” instead of a “Flow state.” In a steady state the repetitive activity allows the body to be distracted enough that there is room for reflection and unconscious material can emerge; solutions to conflicts are resolved. Oh! Now I see why climbing doesn’t really fit into this. Climbing is not easy, can be short lived, requires your maximum attention and isn’t usually repetitive unless you are doing laps on a route. And because it requires my maximum attention (at least when I’m climbing hard routes) I don’t find the space to reflect on my daily conflicts but rather it gives me a break from thinking about them for the time that I’m climbing. But wait. So they are saying that if climbing could be longer, easy and repetitive then it would put my body into a relaxed concentrated state that would allow for more reflective transformative experiences to emerge? Well, I can do that: traversing and doing laps on easy TR routes. Some of the most satisfying work outs I’ve done were ones where I didn’t work on projects and instead traversed and climbed laps on easy routes. Satisfying in that I felt physically spent and emotionally grounded afterwards. Much like after walking, swimming and jogging.